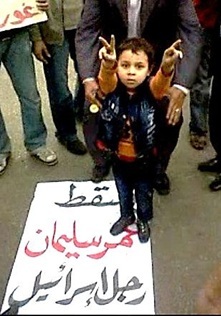 Photo credit: Monasosh: During Egypt’s “Days of Rage”; The sign reads, “Down with Omar Suleiman, Israel man”. Omar Suleiman is Egypt’s top intelligence chief. He was appointed vice-president by Hosni Mubarak on January 29, 2011. Suleiman has an anti-Islamist view and is sympathetic toward Israel. Rebellion is refusing to humble oneself under the authority of God. Psa 2:1-12 Why do the heathen rage, and the people imagine a vain thing? 2 The kings of the earth set themselves, and the rulers take counsel together, against the LORD, and against his anointed, saying, 3 Let us break their bands asunder, and cast away their cords from us. 4 He that sitteth in the heavens shall laugh: the Lord shall have them in derision. 5 Then shall he speak unto them in his wrath, and vex them in his sore displeasure. 6 Yet have I set my king upon my holy hill of Zion. 7 I will declare the decree: the LORD hath said unto me, Thou art my Son; this day have I begotten thee. 8 Ask of me, and I shall give thee the heathen for thine inheritance, and the uttermost parts of the earth for thy possession. 9 Thou shalt break them with a rod of iron; thou shalt dash them in pieces like a potter’s vessel. 10 Be wise now therefore, O ye kings: be instructed, ye judges of the earth. 11 Serve the LORD with fear, and rejoice with trembling. 12 Kiss the Son, lest he be angry, and ye perish from the way, when his wrath is kindled but a little. Blessed are all they that put their trust in him. Why do the Heathen Rage? Let’s take this one verse at a time. The LORD’s anointed is Jesus Christ. The baptism of Jesus and his anointing with the Holy Spirit is recorded in all four gospels. This anointing of the Holy Spirit and the witness of God’s own voice prove that Jesus is the Son of God. We also have the following report of an eye-witness, namely John the Baptist. In the mouth of two or three witnesses shall every word be established. Mar 1:9-11 And it came to pass in those days, that Jesus came from Nazareth of Galilee, and was baptized of John in Jordan. 10 And straightway coming up out of the water, he saw the heavens opened, and the Spirit like a dove descending upon him: 11 And there came a voice from heaven, saying, Thou art my beloved Son, in whom I am well pleased. Psa 2:3-5 Let us break their bands asunder, and cast away their cords from us. 4 He that sitteth in the heavens shall laugh: the Lord shall have them in derision. 5 Then shall he speak unto them in his wrath, and vex them in his sore displeasure. Why do the Heathen Rage? Here is the answer to our question. The heathen declare they will remove any authority or accountability that God the father or his Son have over them. This is of course impossible. God laughs at their opposition. Created earthly powers cannot compare with his power. They are too far inferior. God is above everything and separate from his creation. Rebellion is a certain type of sin. It is more insidious than sexual immorality or murder or theft. Rebellion is refusing to humble oneself under the authority of the one true God. The result of rebellion is everlasting punishment. The nations rage in order to break accountability to God. This vain rage results in Israel’s sore distress. In “the day of the Lord”, God will break the yoke that the heathen has placed on the neck of Israel. Israel will no longer have to bend to international pressure to give up their land or defend their right to exist. Psa 2:6-9 Yet have I set my king upon my holy hill of Zion. 7 I will declare the decree: the LORD hath said unto me, Thou art my Son; this day have I begotten thee. 8 Ask of me, and I shall give thee the heathen for thine inheritance, and the uttermost parts of the earth for thy possession. 9 Thou shalt break them with a rod of iron; thou shalt dash them in pieces like a potter’s vessel. After the “heathen rage” God places Jesus upon his everlasting throne in Jerusalem and gives him great honor. All nations are put under the authority of Jesus Christ. They are his to rule and judge forever. Psa 2:10-12 Be wise now therefore, O ye kings: be instructed, ye judges of the earth. 11 Serve the LORD with fear, and rejoice with trembling. 12 Kiss the Son, lest he be angry, and ye perish from the way, when his wrath is kindled but a little. Blessed are all they that put their trust in him. Kings, Presidents, Governors listen up! When Jesus is king on Earth; he will reign with an iron rod. He will not tolerate dissent. My advice is that you begin serving him now. Who are the “heathen”? What does the original Hebrew term go’ee or goyim mean? “Goyim” is commonly translated as nations, heathen, or gentiles in the English Bible. According to “Strong’s Hebrew and Greek Dictionaries” the root of go’ee refers to a massing of people, nations, animals, or locusts etc. Apparently from the same root as H1465 (in the sense of massing); a foreign nation; hence a Gentile; also (figuratively) a troop of animals, or a flight of locusts: – Gentile, heathen, nation, people. In Joel’s three short chapters, God warns Israel that a nation is coming against them who are like locusts. There are a lot of them and they leave a path of destruction. Babylon partly fulfilled this prophecy in 608-585 B.C. Babylon attacked Judah on three different occasions. Joel’s prophecy also refers to a future invasion just prior to “the great and the terrible day of the Lord” (Joel 1:15, 2:1, 2:31, 3:14). Palmerworm, locust, cankerworm, and caterpillar are all referring to types of locusts. Joe 1:4 That which the palmerworm hath left hath the locust eaten; and that which the locust hath left hath the cankerworm eaten; and that which the cankerworm hath left hath the caterpiller eaten. 5 Awake, ye drunkards, and weep; and howl, all ye drinkers of wine, because of the new wine; for it is cut off from your mouth. 6 For a nation is come up upon my land, strong, and without number, whose teeth are the teeth of a lion, and he hath the cheek teeth of a great lion. The locusts look like horses with teeth of a lion! Joe 2:4-5 The appearance of them is as the appearance of horses; and as horsemen, so shall they run. 5 Like the noise of chariots on the tops of mountains shall they leap, like the noise of a flame of fire that devoureth the stubble, as a strong people set in battle array. The description of the locusts in revelation is nearly identical to that in Joel. Rev 9:7-11 And the shapes of the locusts were like unto horses prepared unto battle; and on their heads were as it were crowns like gold, and their faces were as the faces of men. 8 And they had hair as the hair of women, and their teeth were as the teeth of lions. 9 And they had breastplates, as it were breastplates of iron; and the sound of their wings was as the sound of chariots of many horses running to battle. 10 And they had tails like unto scorpions, and there were stings in their tails: and their power was to hurt men five months. 11 And they had a king over them, which is the angel of the bottomless pit, whose name in the Hebrew tongue is Abaddon, but in the Greek tongue hath his name Apollyon. So, according to the root definition of the Hebrew word “goyim” and the prophet Joel, the “heathen” will invade Israel like locusts. “Why do the heathen rage, and the people imagine a vain thing? “ After the death and resurrection of Jesus the apostles Peter and John remember King David’s question. Act 4:25-28 Who by the mouth of thy servant David hast said, Why did the heathen rage, and the people imagine vain things? 26 The kings of the earth stood up, and the rulers were gathered together against the Lord, and against his Christ. 27 For of a truth against thy holy child Jesus, whom thou hast anointed, both Herod, and Pontius Pilate, with the Gentiles, and the people of Israel, were gathered together, 28 For to do whatsoever thy hand and thy counsel determined before to be done. In Acts 4 the heathen rage and put Jesus to death. Perhaps heathen today reason they can accomplish this again. They forget that Jesus Christ rose from the dead. God raised him up, because it was not possible that death could hold him (Acts 2:24). Christ’s death does not satisfy King David’s prophecy. The heathen are raging again. This time God will place Jesus upon his everlasting throne in Jerusalem. God asked the question, “Why do the heathen rage?”. Today the world is answering that question. They say that the heathen rage for democracy. Of course they are giving the wrong answer. God knew they would. He gave the question “Why do the Heathen Rage?” as a sign of the end times. The heathen are raging and we are very close to Christ’s coming for his church, the Great Tribulation, and most importantly the establishment of Jesus Christ’s kingdom on Earth.